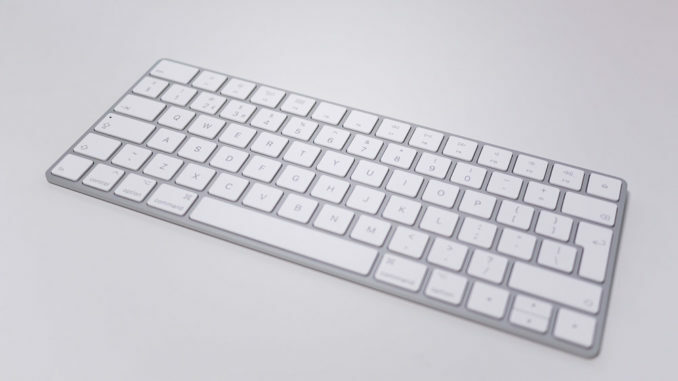 The Apple Magic Keyboard was released just over two years ago, to replace the Apple Wireless keyboard which had been released over 10 years previous in 2003. It is the keyboard shipped with all current iMac models, and it’s also available to buy separately. They key mechanisms are the same as those used in Apple’s notebooks. What you’re basically buying, then, is an Apple notebook keyboard in a sleek external aluminium case. The keyboard connects via Bluetooth. While it’s designed for use in Mac OS X, it will also connect to, and work perfectly with, Windows PC’s and laptops with Bluetooth. It is also compatible with Apple’s iPad, iPhone, and even Android phones. While the original Apple wireless keyboard used AA batteries, the Apple Magic Keyboard has a built-in rechargeable battery. In practice, the battery lasts a month of daily usage. Charging is via a lightning cable. Apple really need to stop using these proprietary cables and switch to USB-C for all of their peripherals and the iPhone / iPad. Especially now that Apple’s notebook computers only ship with USB-C ports. It’s farcical that you can’t connect an Apple phone or an Apple keyboard to an Apple computer without buying a third-party adapter. -Uses proprietary cables for charging.